We are an international family, living and serving overseas with the Church of the Nazarene in Croatia. Click HERE to read about our Profile in "Engage" magazine. From a young age we both felt a calling to pursue international mission work. We married 3 years after graduating from Eastern Nazarene College and felt God calling us towards the next step in our journey...theological education. So, we both received our Masters Degrees in Theology from Fuller Theological Seminary in 2007. It was towards the end of our time at Fuller when we knew God was asking us to take the next steps towards International Missions. We had always had a heart for Europe after serving in Bulgaria during our first year of marriage and after serving for almost a year with a church in Montpellier, France. 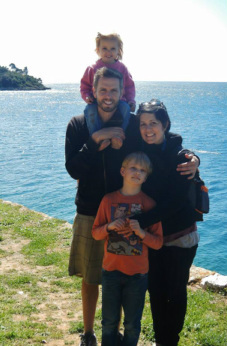 We felt called to move to Croatia in January of 2010. We've had great joy in looking back on our lives to see how God has prepared us for each next step of our lives. Betsy's had a love of languages since she was very young and we've both had a love of other cultures since we were children. While at Seminary, Dave's focus was on Intercultural Studies and the church in Post-Modern society, and Betsy focused her studies in Pastoral Counseling, including Family Therapy and Women's Studies.